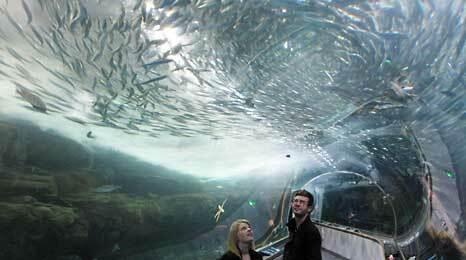 The Aquarium of the Bay is a mid sized aquarium that specializes in the animals that live in the San Francisco Bay. It has an educational mission of teaching visitors about the ecology of the bay and how it has been impacted by human development. Its big attraction is some 300 feet of a plexiglas tunnel that goes through a large aquarium, giving one the sense of being under the bay. The aquarium is organized into three sections: Discover the Bay, Under the Bay and Touch the Bay. One enters the aquarium through the Discover the Bay section, where the educational material teaches one about the bay's ecosystem. After taking an elevator to the bottom floor, one goes through the tunnel in the Under the Bay section. Most memorable in this section, besides the tunnel, are the aquariums holding jelly fish and octopi. An elevator ride back to the top floor takes one to the Touch the Bay, which has petting ponds, where you can touch rays, skates and a leopard shark. One exits the aquarium through what could be called the forth section, Buy the Bay, a large gift shop filled with everything fishy.